Hi, everybody, I’m introducing another Korean popular side dish to you today, godeungeo-gui – grilled mackerel. This salty mackerel side dish is one of the most common fish dishes in Korea. Mackerel is known as a fish that is a great source of nutrients such as good fat (omega 3 fatty acids), protein, vitamins, and minerals! The more important reason for me to like this fish is that it’s tasty! What else? : ) Yes, it’s also cheap! When I lived in Korea, I used to buy a huge box of mackerel and split it with my friends. It was usual for us to meet at the wholesale fish market early in the morning to shop for fish! : ) I don’t think I can do it now, but at the time it was a good way to save money and get very fresh mackerels during mackerel season. Besides, meeting my best friends at the market was a lot of fun. 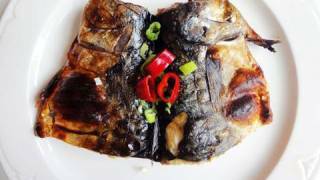 In this video I only have 1 fish, but if you have a large family, or all your family members love mackerel, prepare several fish following my directions in the video and then wrap each piece of godeungeo in saran wrap. Keep them in the freezer and you can enjoy them for a long time. 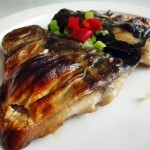 1 mackerel (1¼ pound or about 600 grams), salt, vegetable oil, flour. Remove the guts from the fish – watch the video to see how. Rinse the fish in cold water and drain. Cut it in half crosswise. Sprinkle 1½ tbs salt evenly on both sides of each piece of fish. Keep it in the refrigerator for at least 30 minutes before cooking. Now you can either pan-fry or grill. Coat both sides of fish with flour. Heat up the pan and add 2 tbs vegetable oil. Cook the fish for 3 minutes over medium high heat, until golden brown. Turn it over with a spatula and cook for 7 minutes over low heat. Turn it over and cook for 1-2 more minutes before transferring it to a plate. Preheat the oven and set it broil. Rub some vegetable oil on both sides of the fish. Broil on the bottom rack of the oven for 10-12 minutes. Turn it over and cook 4-5 more minutes, until golden brown. Posted on Saturday, July 31st, 2010 at 3:29 pm. Last updated on August 7, 2017. Posted November 7th, 2018 at 7:29 pm | Log in to reply. Easy and excellent. Tons of salt is not necessary. Just lightly sprinkle a pinch on both sides with your fingers. Thank you, Maangchi. Posted August 4th, 2013 at 6:01 am | Log in to reply. Hi Maangchi, I have always wanted to cook saba fish and korean ginseng chicken soup myself. Always thought it is difficult to prepare and cook. Your videos were fantastic! Thank you for sharing! But I would like to ask on the exact amount of kosher salt I should use to rub on both sides of the fish? Also does kosher salt refer to coarse or sea salt? Posted August 5th, 2013 at 11:40 am | Log in to reply. I use kosher salt. Regarding amount of salt, check out the direction step 4 : “Sprinkle 1½ tbs salt evenly on both sides of each piece of fish” for 1 mackerel (1¼ pound or about 600 grams). Good luck with your Korean cooking! Posted August 25th, 2012 at 7:29 pm | Log in to reply. I can’t wait to try this recipe. If I freeze the fish, should I let it thaw before cooking? Posted August 26th, 2012 at 9:40 am | Log in to reply. yes, thaw it out before cooking. Posted September 14th, 2011 at 6:50 pm | Log in to reply. Thanks Maangchi! I made grilled and fried mackerel for lunch today and it was delicious! Both versions are very tasty and the best part was lunch for 2 only cost me $2 O_O! The fish was frozen but was still fresh and the meat was sweet and flakey (not dry at all although I put it in the broiler till it turned brown). Will definitely make this again nomnomnom. Posted August 26th, 2012 at 9:42 am | Log in to reply. Posted September 7th, 2011 at 1:05 am | Log in to reply. Posted August 26th, 2012 at 9:43 am | Log in to reply. Great, I’m very happy to hear that! Happy cooking! Posted April 3rd, 2011 at 12:21 am | Log in to reply. what temperature do you broil the mackerel at? Also, can sea salt be used to instead of Kosher salt? Posted April 3rd, 2011 at 10:49 am | Log in to reply. yes, sea salt will be even better. If you gill it with your oven, set it broil (500 F, 260 C). “Preheat the oven and set it broil. Posted March 15th, 2011 at 1:27 pm | Log in to reply. thank you Magngchi, my son love to eat this fish, i made it one more time, he eat all with rice, thank you so much for posting all recipes, have a nice day. Posted August 7th, 2010 at 9:57 pm | Log in to reply. You have great timing Maangchi! I thought I was going to have to hunt down this recipe but it was right there waiting for me when I got on this site! (I didn’t even know what type of fish it was.) Thank you for all the recipes and videos. I plan on making this, the rainbow rice cake, and some other things for my Mom’s birthday next week. She’s Korean and she loves your recipes too. THANK YOU! Posted August 8th, 2010 at 5:42 am | Log in to reply. Great plan! You mom will be proud of you! Posted August 7th, 2010 at 9:50 pm | Log in to reply. Mmmmm mackerel is my favorite fish. Is it better to buy it whole? I always buy the ones that are already cleaned. Posted August 8th, 2010 at 5:54 am | Log in to reply. Buying whole fish is much cheaper. Posted August 2nd, 2017 at 5:25 pm | Log in to reply. I bought two frozen filets (each enough for two servings) today at my favorite Asian Supermarket here in Fresno CA for $1.99 that is going to make 4 nice cheap dinners with some rice and a vegetable or korean vegetable pancake. Posted August 5th, 2010 at 6:28 pm | Log in to reply. I’m so excited! I just found some beautiful mackerel at the fish market and I’m going to make it for dinner tonight. I got some Himalayan pink sea salt as a gift and I’m going to try it on this. The crispy skin looks very good! Posted August 5th, 2010 at 8:02 pm | Log in to reply. Posted August 2nd, 2010 at 2:47 am | Log in to reply. I can’t wait to go to the store and buy some mackerel! This looks healthy and delicious! Posted August 5th, 2010 at 8:03 pm | Log in to reply. yeah, your children will love it. Posted August 17th, 2010 at 9:13 pm | Log in to reply. I made this last night! My daughter loved it! Thank you again for this wonderful recipe! Posted August 18th, 2010 at 9:26 am | Log in to reply. I’m glad your daughter liked it! nice! Posted August 1st, 2010 at 4:59 pm | Log in to reply. Posted August 5th, 2010 at 8:04 pm | Log in to reply. holy makerel! You are a makerel lover! Posted August 8th, 2010 at 7:10 pm | Log in to reply. Posted August 1st, 2010 at 12:02 am | Log in to reply. This is one of my favorite Korean foods. I really didn’t like fish that much until I moved to Korea. The secret is in the salt. You really gotta season these buggers. Korea really knows how to grill fish. Posted August 1st, 2010 at 6:34 am | Log in to reply. yeah, as I mentioned in the blog, godeungeo gui is one of the most common fish dishes in Korea. “The secret is in the salt” that’s right! Posted July 31st, 2010 at 11:16 pm | Log in to reply. It’s almost a shame to burn away all the pretty blue stripes. I’ve been wondering how to roast fish, now I can do it! I’ll have to find mackrel soon! Posted August 1st, 2010 at 6:35 am | Log in to reply. hope you can find it easily. Posted July 31st, 2010 at 5:49 pm | Log in to reply. Maangchi Onni,..watching this video makes my mouth water too..It look so yummy!! Posted August 1st, 2010 at 6:37 am | Log in to reply. This recipe was originally posted on July 31, 2010 at 3:29 pm by Maangchi. It was last updated on August 7, 2017. The video was watched 261,217 times on YouTube & has 1,674 likes!